Hello to you all! 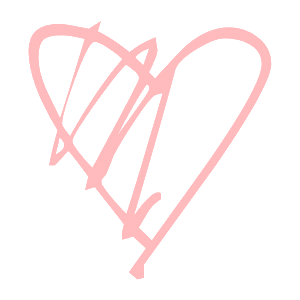 Narelle here – its my first blog attempt so bare with me. Hopefully the toy boxes turn out better then this blog post :). This project came about during my pregnancy with Ava. Whilst designing and planning Ava’s room I knew that I wanted to incorporate a liberty into this room. We already knew that the interior range by Liberty Art Fabrics was visually fantastic but when we finally got it in stock it wasn’t just fantastic it was spectacular to feel! 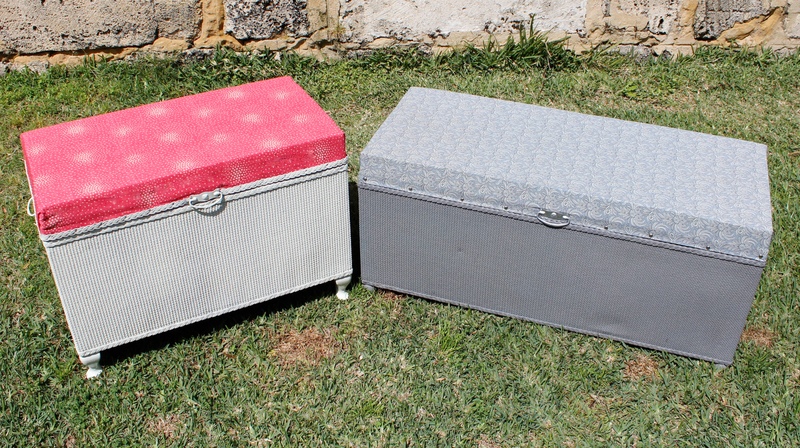 We were so excited to have a play with the fabric that Martina and I raced out to something special in our local antique/ second hand shops that we could transform and this is what we found – 2 adorable, very cute toy boxes that were in fantastic condition but needed some much needed TLC. It was perfect for this project. 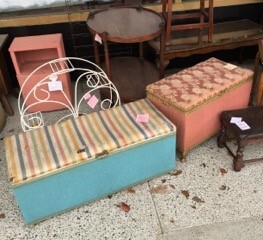 I love a bit of bargaining and getting a deal – (Martina is not so great at it 🙂 she won’t mind me saying that given I am the go to girl when she needs to barter something), we were able to pick up the 2 toy boxes and a foot stool (for a later project) for $150. So here’s lesson no 1 – never be afraid to wheel and deal in the antique shops bursting at the brim with products, what’s the worst that can happen? They say no, nothing gained nothing lost. Now, I’m no DIY expert nor have any professional tradesman skills, but I love having a go and transforming older pieces to fit in with a new decor. I’m sure those with more skills than I might have better technical skills to do the job. However for all you out there that like doing it for themselves…. 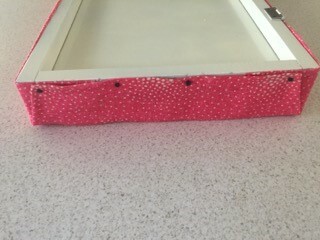 heres how it went down: First, unscrew the lid from the base and strip the fabric off the lids carefully. To be honest stripping the fabric was the hardest part of the project, I like to try and get all the old nails and staples out – its not essential as its going to be recovered but I feel it will give a better finish and it makes knocking in the new nails much easier with a clean slate.I decided to keep the trim intact as best as possible when I was removing it as I liked the look and wanted to try re-use it. Once it was removed I then brushed and wiped them over to remove any dust and dirt before I started painting. Painting on a dirty surface is not advisable. The next step was to paint my life away…. 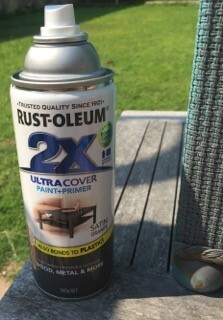 Spray paint – what fun! Too keep it simple i kept it to one colour on each (please read the instructions on the spray cans for cure and coat times). 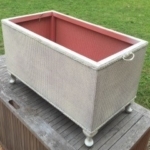 In our toy boxes we used Ivory on one and gun metal grey on the other. It took a few cans of paint on each to achieve the desired look. Before you commence the painting process give a thought to the hinges. Do you want to paint them or have a more industrial look and keep them in their natural state. If you want them painted the same colour as your box be sure you paint those while you have the paint out. We decided to paint them for a more even finish and they were in great condition. 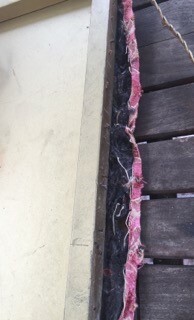 One of the things we noticed on the toy chests were that the filling on the lip was quiet thin and deteriorated. I wanted it more plush, so I popped into our local Clark Rubber store and had some new foam cut to size. For both toy chests I used 5cm firm foam – having them pre-cut for you seriously takes away a lot of tears of frustration. Next Lay out your liberty fabric. We’ve used Flamingo Interior fabric and Liberty Chambray in Paisley. Ensure that its nice and flat with no waves in it or your measurements will be out. Measure twice cut once is the golden rule and we need to ensure there is enough to completely cover the foam, edge of the lid and an extra bit to roll under to make a clean edge (because we have a trim going back on) however if you decided go without a trim, then ensure there is enough to crease inside the lid and secure it with nails or staples. I decided to tac the fabric onto the ivory chest. Tac’s have flat heads so it will be covered by the trim neatly and I don’t own a staple gun (yet). On the gun metal coloured chest I chose a more decorative headed tac. I found these at my local bunnings for about $5.00. 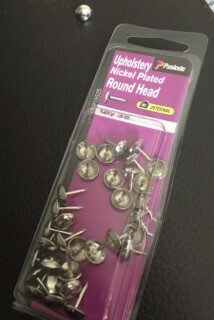 You need to be a little more accurate with hammering as these tend to bend easy. Here’s a little handy hint and tip. DO NOT hammer in the tacs initially. 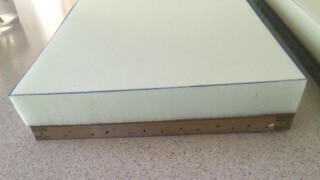 So that you can test the tension only partially hammer these in, this also ensures you have enough fabric to roll under on both sides PLUS makes it easier to pull them out if they’re only half hammered in if there was a problem. 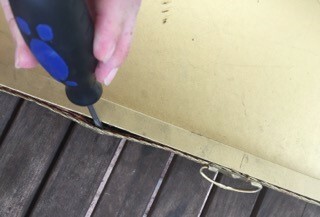 There are many way to do the corners – much like quilting and wrapping a present. I choose to do a square corner on the top, simply fold in the corners and nail down. Once I was happy with the look with no pulls and uneven tension I hammered the tac in all the way. The Chambray if finer and therefore has a lot more given to it than the interior range. Which called for a little more patience to get the tension right all the way around without it pulling the edge down or having waves in it. I am sure you would agree… preserving has paid off! The very last thing I needed to add was the trim back onto the ivory box lid. This was a little fiddly than I anticipated especially with lining it straight around the circumference of the lid. Plus, you want enough of the trim secured under head of the tac to stay in place. Now all that it needs are the little handles put back on, which I painted and reused. Then screw the tops back onto the chests. Oh and the best news you can now grab the interior range from our website.